If you've been to Boston, then you've probably walked by one of Tatte's Bakery's many locations. This aesthetically stunning bakery is probably best known for their fresh baked pastries along with their amazing coffees and fresh pressed juices. They serve both breakfast and lunch and we think it would be a good idea if you took them up on that offer. Their Croque Monsieur is no joke. 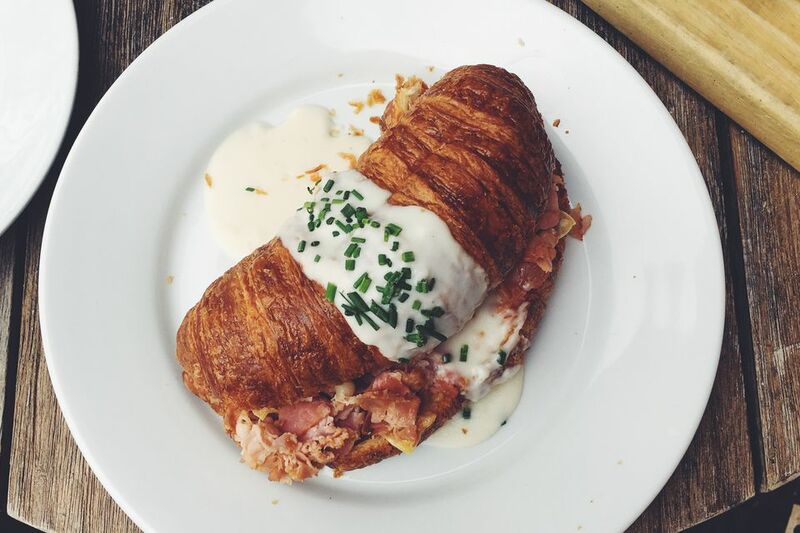 Made on one of their monster sized toasted croissants and loaded with crispy shreds of ham, a creamy bechamel sauce and an optional egg - It was the size of both my hands and was so perfectly flaky, meat-y, and creamy. Oh, and filling. It was very filling. As the cheesy proprietor behind Grilled Cheese Social, I always try to support my fellow grilled cheese homies when I travel. I'd heard of Roxy's Grilled Cheese through all of my awesome social media followers so we decided to give it a go. They have quite a few locations in Boston due to the nature of food trucks, but for the sake of the tour, we went to their brick and mortar in the Allston neighborhood. Their menu was packed full of delicious grilled cheese sandwiches, tasty burgers, bubbly beer, and insane poutine creations. We fell in love with their Muenster Melt - a creamy, crispy concoction made with fresh housemade guacamole, bacon and muenster cheese. We'd been crushing on Lone Star Taco's instagram for quite some time before we headed to Boston so we were extra stoked to finally try it out! We instantly became obsessed with their fried pork cutlet torta. Loaded with a giant slab of perfectly fried pork - it was crispy, salty, and utterly juicy. It also had this beautifully melted Oaxacan cheese that covered sweet chunks of grilled pineapple. To hold it all together, there was a layer of refried beans studded with shreds of pickled red onions and fresh cilantro. It was basically everything we'd ever dreamt of. Full disclosure, I'm super allergic to lobster so my partner in crime and real life pro-surfer, Jeremy Johnston, did the taste testing. Alive and Kicking is a hidden little gem in Cambridge. Located down a side street lined with houses, this little shack tosses chunks of fresh lobster with mayo and serves it with white bread and potato chips. It was simple and pure, and apparently one of the most delicious-tasting lobster dishes Jerm has ever had. A lot of our Boston friends told us that we had to check out Anna's Taqueria so we did! We ordered their loaded chicken veggie burritos with all the fixin's! Fresh roasted veggies, brown rice, refried beans, sour cream, guacamole, pickled veg, and tender chunks of marinated chicken! We ate this sandwich during the day, but I could totally see this being one of those things you eat late night after a too-much-fun night on the town! I love me a good po'boy and Saus did not disappoint! Crispy nuggets of fried chicken, crunchy scallion slaw, dill pickles and fresh mayo, on a toasted brioche roll. Simple, decadent unadulterated goodness in the form of a sandwich. Try pairing it with one of their over the top poutines or one of their adults-only sweets like the Apple Pie Float made with Downeast Cider, vanilla bean ice cream, speculoos cookie crumble, and salted caramel saus. Sounds amazing, right? Monica's does not mess around which is made evident by the constant row of hungry patrons lining their block. This little honey hole is everything you'd ever want in an Italian market. Lined with high shelves full of imported goods, a fully stocked counter chocked full of meat, cheese, antipasta, and the like, Monica's has all the hard to find Italian goodies that you'd ever need. And since a lot of our instagram followers told us that we had to get their Italain which was loaded with prosciutto, mortadella, salami, provolone, lettuce, tomato, onion, oil, balsamic, hots, and pickles. We did. And yes, you guys were right. It was definitely one of the best italians we've ever had and I loved the "hots" which I'm guessing is just slang for giardiniera. I will totally be using that. Whenever I'd go to Boston growing up, we'd always make it a tradition to get breakfast at Trident Booksellers & Cafe. Just as it sounds, this cozy little nook is one part diner and one part bookstore that serves solid, consistent meals that warm the body and the mind. Their monte cristo breakfast sandwich will make you want to go back to sleep in the best way possible. Sandwiched between two thick pieces of texas toast and layered with cheese, fried egg, canadian bacon, and raspberry jam, this sandwich is then finished with a drizzle of maple syrup. My brains getting fuzzy even thinking about it now. Little Donkey is a genius. They've seemlessly combined low brow with high brow in their signature burger - The Little Donkey Burger. By using dry aged beef to make their patty, foie gras folded onions, thick slices of american cheese, buffalo pickles, onion soup mayo, and jalapeno chips on a potato bun, they've created the perfect sandwich. I would recommend taking a vacation around this burger. It's that good. Cutty's is a Brookline institution that everyone knows about. Their Roast Beef 1000 is probably what they're most known for and is their version of this Bean Town staple. After just one bite of their RB1000, made with slow-roasted beef, crispy shallots, 1000 island, and sharp cheddar on brioche, this sandwich will always have a spot in your heart. Mei Mei's was one of the first places we visited on our trip to Boston and it was probably my most favorite. Their scallion pancake sandwich was loaded with white cheddar cheese, a runny egg, crispy local ham and fresh, seasonal, pesto made with local greens. The sandwich was light, and chewy and perfectly textured. I still dream about it. There's a million Clover Food Labs sprouting up all over Boston and the world is a better place because of it. Their fried chickpea fritter sandwich takes falafel to the next level by using seasonal (never-frozen) ingredients that change daily. We hit one of their food truck locations which offered 2 tempting sandwiches that were both vegetarian and both totally amazing.